When this local nonprofit approached The Creative Alliance some months ago, their name was captivating: Realizing Aptitudes Foundation. Kids are frequently asked, “What do you want to be when you grow up?”, college students often hear, “What is your major?”, and adults usually open conversations with, “What kind of work are you in?” For many, those questions cause anxiety. The recipe for Realizing Aptitudes’ success blends a thorough examination of a person’s skills and interests with an understanding of coping abilities and personality traits, then mixes those results with an honest measurement of his or her cognitive abilities. Voila! The client is presented with meaningful, insightful vocational advice in the form of career options. Then, they are equipped with tools to further investigate those possible jobs and find a more-than-suitable match. While developing the Realizing Aptitudes’ website, our main focus was on attracting and informing three main audiences: students, parents and professionals. The UI is fresh, colorful, kinetic and useful. Content is digestible and helpful, if not persuasive. 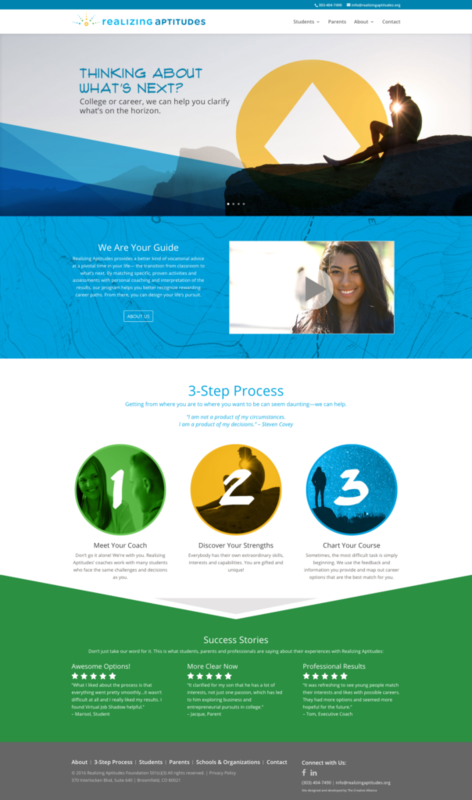 We included multiple testimonials both in video and copy, and retained an outdoorsy theme with the optics reminiscent of a journey or adventure. Kudos to Realizing Aptitudes Foundation for their service to our community!